Defi-Link Display is a multipurpose monitor which provides information on speed, oil temperature, water temperature, oil pressure, fuel pressure, and exhaust temperature by connecting to the Defi-Link Control Unit II or the Defi-Link Control Unit(end of sale). Defi-Link Display can be connected to Defi-Link Meters and Defi-Link Meter BFs by using the DAISY CHAIN wiring system. The display uses OLED. 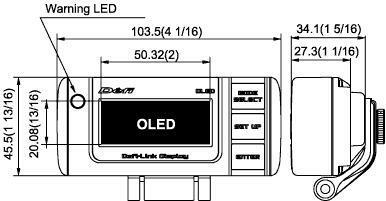 OLED is an advanced display which is self light emissive, high contrast, high response, low power consumptive, and large view angle. It uses optimal technology for instant readability without afterimages of flicker even when seen from the passenger’s seat. Real-time digital information includes speed, oil temperature, water temperature, oil pressure, fuel pressure and exhaust temperature. Sensor sets need to be purchased separately to display the information on pressures and temperatures. Vehicle performance data and peak values are placed in memory for 3 minutes, allowing examination of data after running the vehicle. *Defi-Link Control Unit II has a 3 minute memory. Defi-Link Control Unit has a 40 second memory. When the RPM signal wire is connected to Defi-Link Control Unit II or Defi-Link Control Unit, 2 warning levels can be set in addition to the warning setting made by Control Unit II or Control Unit, enabling the setting of a total of 3 warning levels(Tachometer Triple Warning Mode). When the water temperature sensor is connected, the warm-up condition can be monitored. A graphic animation plays after the ignition is turned on or off(Opening Mode/Ending Mode). An easily recognizable graphic on each setting screen helps guide easy setting of warnings for Defi-Link Meters and Step Graph(Setting Assistance function). The Warning LED lights when the set warning value is exceeded for oil temperature, water temperature, exhaust temperature and engine RPM. The Warning LED lights when measured value drops below the set warning value for oil pressure and fuel pressure. Trouble locations are shown by graphics so that connection problems can be quickly corrected(Self-Diagnosis function). The structure of the mounting base allows height and angle adjustment so that it can match the shape of the instrument panel. 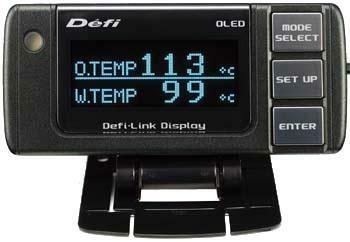 The Defi-Link Indicator(sold separately) can be connected to the display.